SI☆NA: Hello! Pro Kansai make their debut. It has been announced that Kansai based trainee group Hello! Pro Kansai has moved from trainee status to full membership and will debut as SI☆NA. 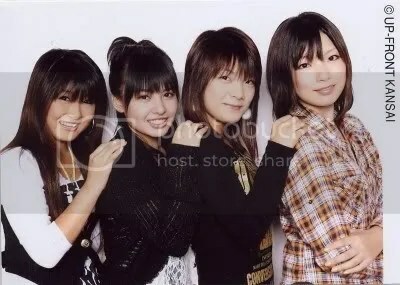 SI☆NA (pronounced shiina) consists of Suma Ai, Iwashima Manami, Nakayama Nana & Abe Asami. Interestingly the whole of the group is also a member of the recently announced HAPPY! STYLE. I’d been hoping Hello! Pro Kansai would gain full membership at some point this year. I’m not sure if they’ll remain Kansai based though I’d like to see them get a release. They’re not a bad group of singers and have more individual looks than the standard Hello! Project fair. It’s unknown at this time if and when SI☆NA will make their musical debut. Isn’t Nacchi’s sister named Abe Asami? That doesn’t look like the same girl though. Yup, Nacchi’s sister is named Abe Asami though they are not the same person, just a coincidence. Nakayama Nana, is it? Looks quite similar to Momoko! !Can you see it? She looks like a conjoined Momoko and Kei.